For Pallbearer, it’s never entirely been about doom metal. This isn’t necessarily something that the Little Rock quartet publicizes in such explicit terms; they’re called Pallbearer, for one, which is a name that could belong only to a group that specializes in epic dirges of intricate guitar work and ominous low end. And in the liner notes to the band’s debut album, Sorrow and Extinction, they thanked Black Sabbath last (“of course”), acknowledging their chosen genre’s mightiest heroes and most enduring legends. 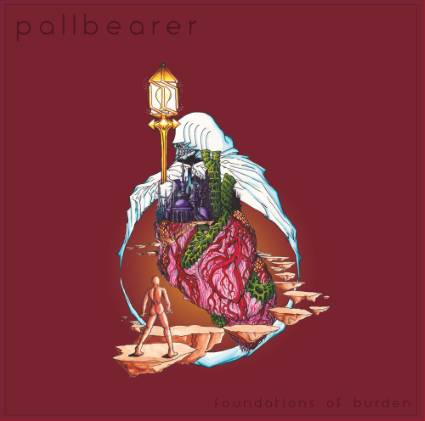 Foundations of Burden, Pallbearer’s second album, only complicates matters. It’s hard to imagine the group creating anything much more massive than their debut, but Foundations of Burden is exactly that, with four of its six songs stretching past 10 minutes apiece. This might make the album sound more intimidating than it is, however. For while their compositions continue to unfold and expand into new and bold terrain, their melodies have never been so strong. It’s tempting to call this a “crossover” record for its potential to appeal to listeners outside of metal, much the same way that bands like Alice in Chains and Soundgarden found audiences in both metal and alternative rock. But to suggest Pallbearer cross over from one realm to another here still feels too limiting; Foundations of Burden occupies its own, continuously expanding space. A band that doesn’t know what to do with a 10-minute song has no business writing them, but the five longest songs on Foundations of Burden (and to a lesser extent, the brief, atmospheric “Ashes”) make the journey worthwhile. The compositions on the album don’t feel long — they’re awe-inspiring and heroic. Each path leads toward a triumphant end, and yet these songs also at times feel like collections of many powerful, individual moments. The massive riff that opens “Worlds Apart” is all that’s necessary to understand just how much of an impact this album leaves in its wake. “Foundations” is the sludgiest of the six tracks here, its murky rumble there to remind listeners that, yes, Pallbearer is still a metal band. And “The Ghost I Used To Be” may very well be the most glorious piece of music the band has ever recorded, from its surprisingly ethereal interlude to its thunderous power chords. There’s a deep, emotional core that pulses through the center of the record, and true to its title, centers on themes of personal burdens that haunt us. In “Worlds Apart,” singer Brett Campbell juxtaposes joy and pain, and how the two are inextricable, first singing “Without light/ The dark encloses us all,” and later, “Without dark/ The light burns out our eyes.” Meanwhile, “The Ghost I Used To Be” finds Campbell exploring the idea of letting go of those burdens that hang so heavy: “The burden of regret/ Kindling to ignite/ And a necessary end/ To living a lie.” Yet, the gravity of the lyrics wouldn’t have quite the same pull if not for Campbell’s vocal range. He doesn’t bark or growl, but rather exercises a broader, melodic vocal style that’s been likened to both Ozzy Osbourne and Geddy Lee. In short: Dude can sing. So much of Foundations of Burden feels like a renewal and redefinition of doom metal than an adherence to its traditions, but the most unexpected characteristic is a more intangible quality: hope. Darkness is around every corner on Foundations of Burden, but if there’s a consistent theme to these songs, its one of overcoming that darkness. In the final track, “Vanished,” Campbell closes out the album by singing, “We’re always shifting/ And always becoming.” The message of personal growth is a strong one on Foundations of Burden, and you can hear it in the music, too. The thing that Pallbearer has become is breathtaking.